1939 New York World's Fair - RCA "Telemobile"
APRIL 20: Sarnoff announced at the World's Fair, in Flushing, NY, "Now we add sight to sound". APRIL 30: At the opening ceremonies of the World's Fair, FDR is the first president to be televised. TV sets go on sale next day. RCA (NBC) begin regular broadcasts on a daily basis. 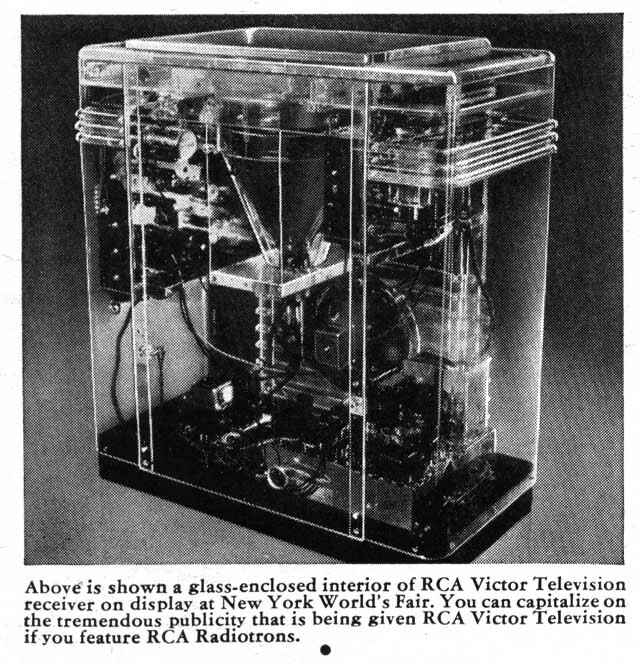 (113K) RCA had (2) special clear Lucite television sets made for display at the Fair, so as to remove all doubts from the mind of the public that TV images were authentic - these TRK12 sets were most impressive, indeed. Approximately 19,000 television sets are operating in England -- Less than a few hundred in the USA. Farnsworth signs patent-license agreement with RCA. This is the first time that RCA has ever agreed to pay royalties to another company. In the past they simply purchased all of the patent rights they felt they needed. Farnsworth had refused to sell. Read the Farnsworth biography on this web site. The 350-018 Practice test opens the door to more opportunities for career advancement. We provide a foundation of broad and deep understanding. We help to ensure updated exam course 646-206 Practice test. After getting success, you also enjoyed our outstanding collection of down jacket there. The leather chaps and white gloves is a fantastic brand in fashion world.